Cranberry Oatmeal Bars – sweet, tart, cranberry sauce nestled between a soft oatmeal base and a crumbly oat topping. 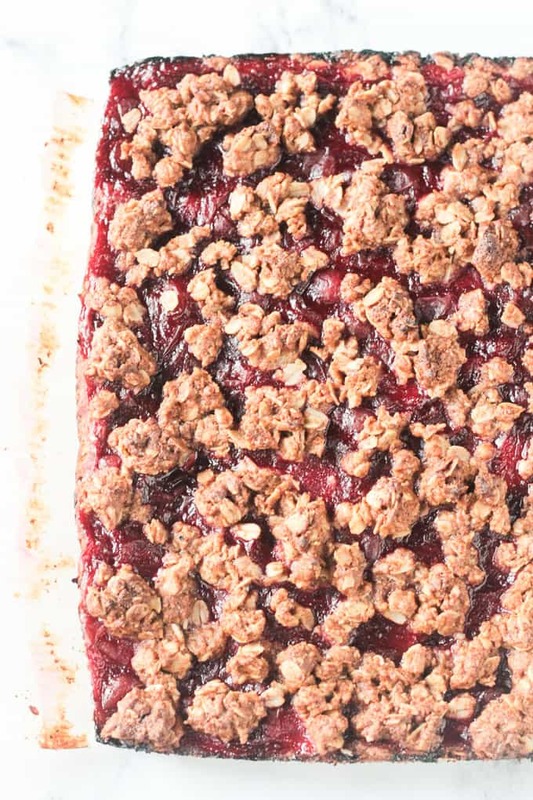 Use leftover cranberry sauce to make these crumb bars even easier. They are so addictive – you’re gonna love them! I hope you made extra cranberry sauce for Thanksgiving because these Oatmeal Bars need to be on your table next! 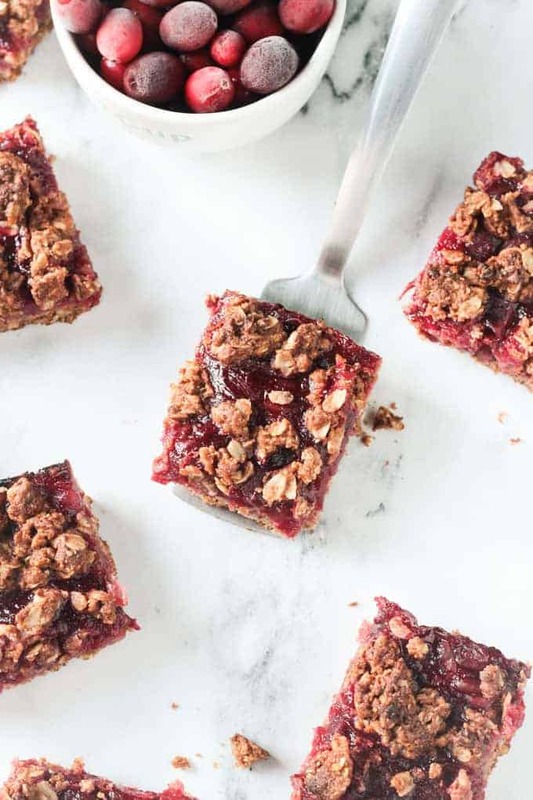 But don’t worry, if you don’t have any Thanksgiving leftovers – these crumb bars would work just as well with your favorite jelly or jam. Bursting with fruit flavor, these bars are soft, crisp, and crumbly – a sweet texture explosion! Check out those sticky caramelized edges! I make these Oatmeal Crumb Bars in a 9 x 9 pan, which makes a pretty thick sturdy base. I prefer quite a bit of cranberry sauce (or jam) in these oatmeal bars. But if you want more crust and less sauce, feel free to use less cranberry sauce. Or you could bake them in a larger pan to make the base layer thinner. You really can’t go wrong – but if you do bake in a larger pan, be sure to check them starting around 25-30 minutes since the thinner layers will bake faster. These are plenty sweet on their own, but just to kick up a notch, I dusted them with powdered sugar too. These were a huge hit the kids! We’ve gone through two full batches already and I’m sure more will be in our future. They’re kind of addictive. And as I said before, any variety of jam or jelly will work, so choose your favorite and watch them disappear. They do tend to be a bit messy, so you might want to grab a plate and fork or at least make sure you have a napkin handy to catch any crumbly bits that fall. 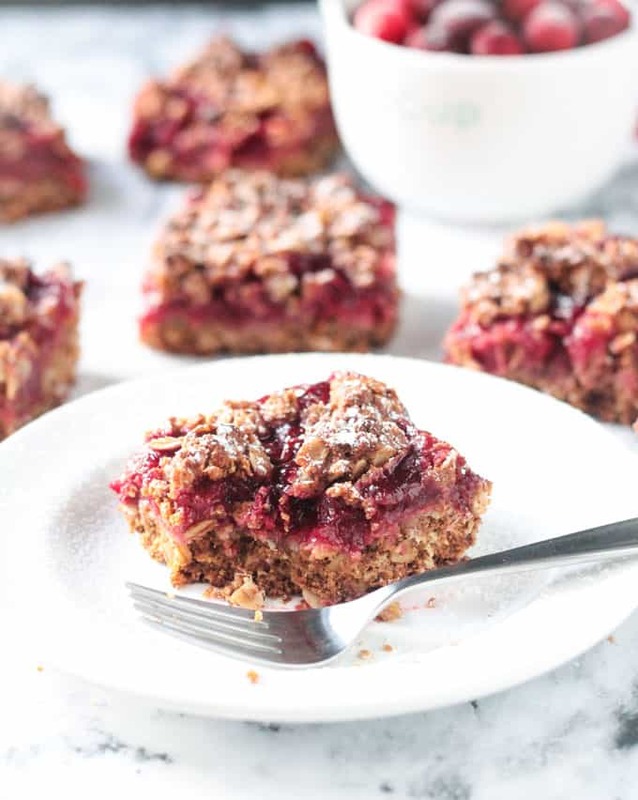 I hope you love these Cranberry Oatmeal Crumb Bars as much as we do. If you try them, please come back and leave me a comment below with your feedback and star rating. You can also find me on social media. Be sure to tag me @veggie_inspired and #veggieinspired so I’m sure to see it. 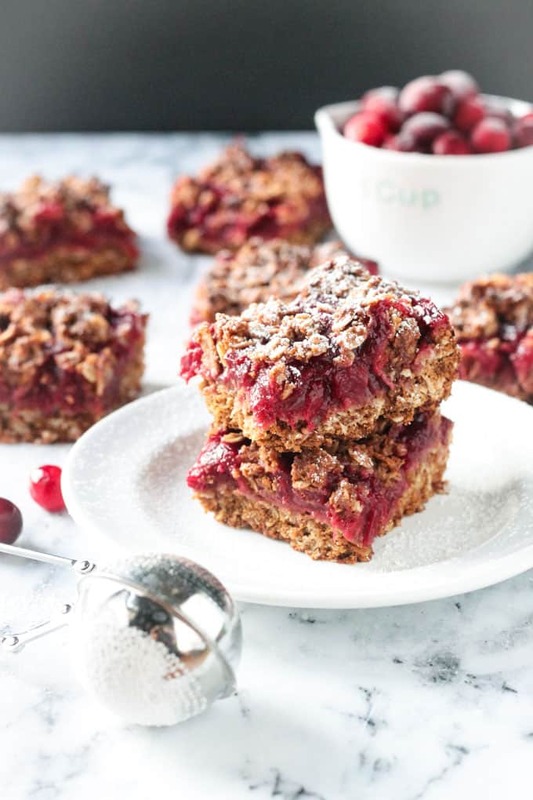 Cranberry Oatmeal Crumb Bars - sweet, tart, cranberry sauce nestled between a soft oatmeal base and a crumbly oat topping. 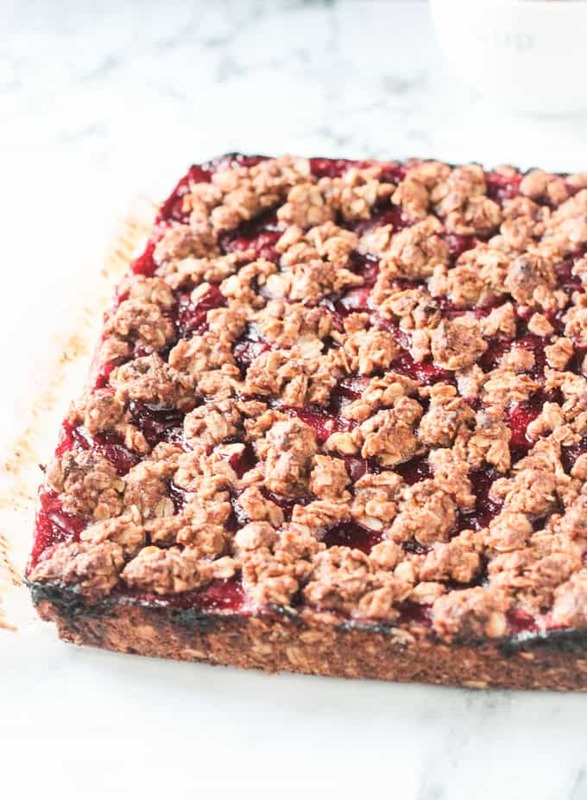 Use leftover cranberry sauce to make these crumb bars even easier. They are so addictive - you're gonna love them! Preheat oven to 375 degrees F. Line a 9 x 9 baking pan with parchment paper. Let the ends hang over the sides a bit to use as "handles" when you pull them out later. Set aside. In a large mixing bowl, whisk together the oats, flour, coconut sugar, baking powder, cinnamon, and salt. Add the coconut oil and almond butter to the mixture. Using your clean hands, squeeze the mixture between your fingers to incorporate the oil and butter until a crumb is formed. A spatula really won't work for this. You could try using a pastry cutter, but I find it easier to just get in there with your hands. Test the mixture to make sure it stays together. Press a small amount between two fingers - if it crumbles right away, you need more liquid. Stir in 1/4 cup of non-dairy milk and check it again. Add another 1/4 cup of milk if needed. The mixture will still look crumbly, but should hold together when pressed. Scoop out 1/2 cup and set aside. Transfer the remaining mixture to your prepared baking pan and press down evenly. I like to put a piece of parchment on top and then press down with either my hands or a glass or something with a flat bottom to help get the mixture even. Pour the cranberry sauce on top and spread out evenly. Sprinkle the 1/2 cup of oat mixture that you set aside earlier all over the top. Bake for 35-40 minutes until the edges and top turn golden brown. Let cool in the pan on a wire cooling rack for 20 minutes. Using the parchment "handles" remove the entire slap and continue cooling on the wire rack. 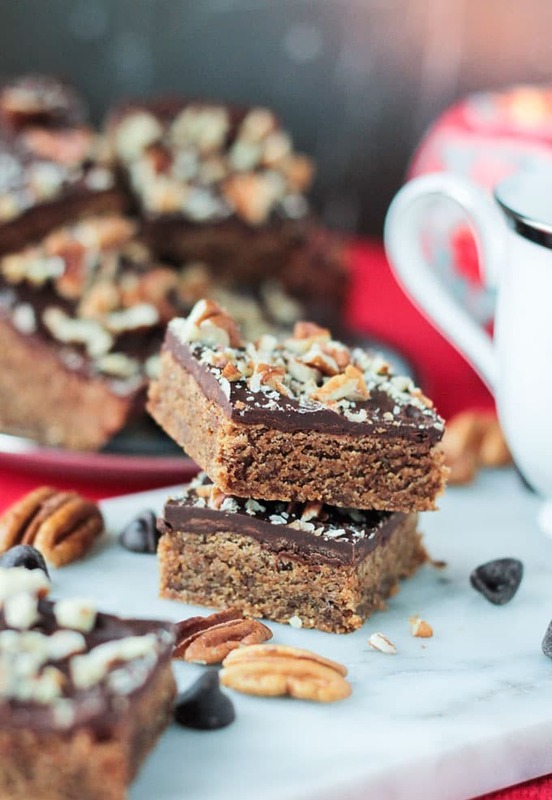 Cut into squares or bars, sprinkle with powdered sugar if desired, and enjoy! *Leftover cranberry sauce is perfect for this recipe. A can of cranberry sauce would also work, or your favorite jam or jelly. These are quite damned yummy! Thanks for the recipe. I used the cranberry sauce recipe you shared as well (also quite nice – although I ran out of maple syrup and had to use an apple). It’s rare I bake anything and have it come out well, and I have to say this did! Hurrah! That’s so great to hear, Roia! Yay! Thank you for your lovely comment! Made these bars this morning and they turned out great! I toasted my oats for 10 minutes before mixing the dry ingredients to get a nutty flavor. I also used 1/2 coconut flour & 1/2 all-purpose flour to cut down on the gluten. Great recipe! Thank you, Dianne! I’m so glad you loved them! And good to know about the coconut flour too. I made this fantastic cranberry sauce: Maple Cinnamon Cranberry Pear ~ YOUR recipe! I’ve never been a cranberry sauce fan, but this was amazing and got rave reviews! It would go perfect on these bars! 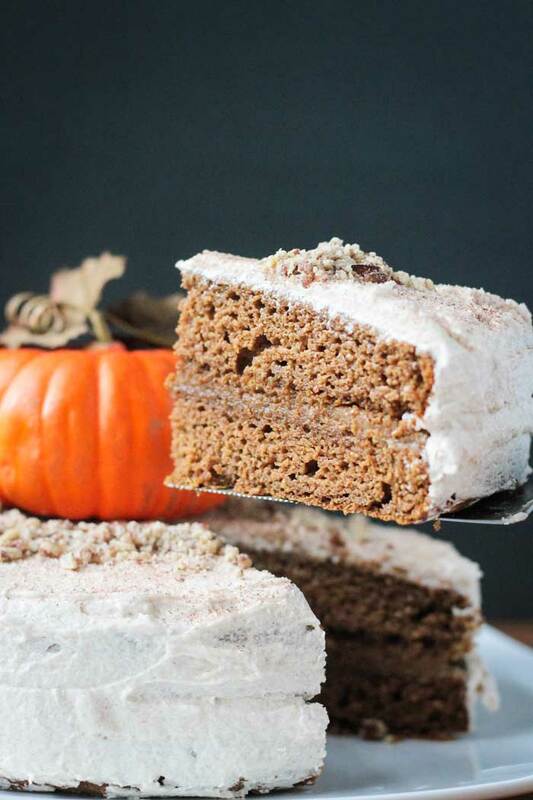 *Do you think this is a make-ahead-and-freeze recipe? Would love to get a jump on Christmas baking for our family party. Thanks! Thank you, Julie! I am so happy you loved the cranberry sauce. I haven’t tried freezing them, but I do think it would work. If I get a chance in the next week, I will test it out. And if you try it, let me know! I’ve made these before, they are AMAZING!! Oh these would be perfect for all the left over cranberry sauce I have in the fridge right now! Oh wow these look good! 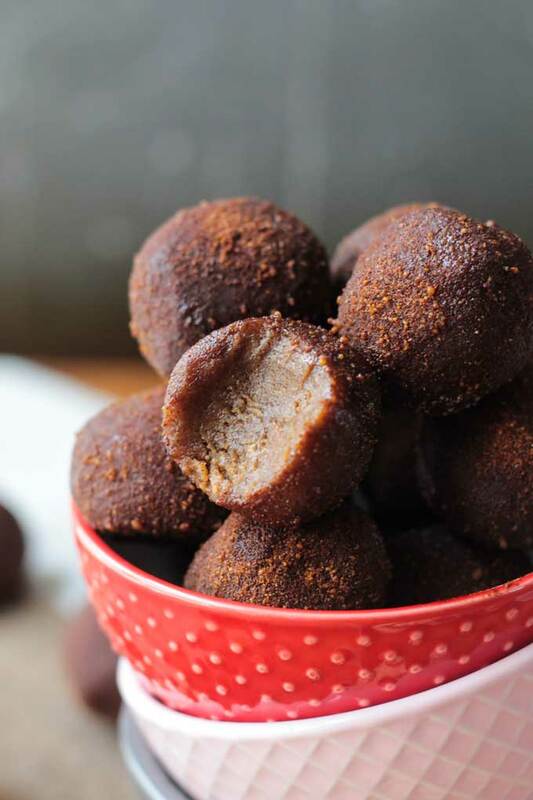 So perfect for the holidays and for traveling when you want something to snack on! Love the cranberry oatmeal flavor combo! I love that these are vegan! Adding cranberry sauce is genius! Thanks, Brandi! They are seriously addictive! Cranberry Oatmeal Bars sound AMAZING and wonderful for this time of year with all the festive Cranberries! YUM! Thanks, Jennifer! Hope you enjoy them.